Knitting stitch markers and their usefullness. What are knitting stitch markers? Knitting stitch markers can be used for knitting or crochet. They come in many sizes shapes and types. They are plastic, metal or fiber. 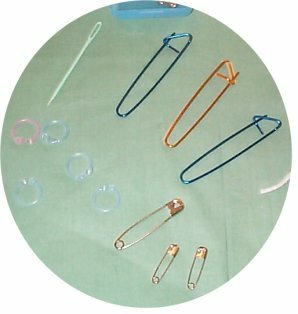 Some look similar to safety pins while others are small circler or clip type markers. The large safety pin type are really stitch holders more than stitch markers. But I use the smaller ones for stitch markers also. While knitting you may need to set aside stitches lets say for a pocket. 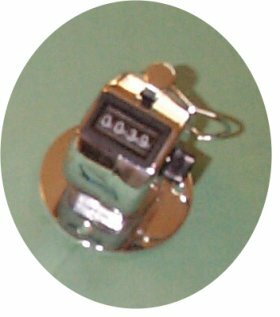 You will place the required number of stitches on the holder and continue knitting. Later you will go back to these stitches and pick them up and finished the pocket. While knitting or crocheting you will often need to mark which side is the right side or wrong side. When knitting in circles for example, you may need to mark the beginning of the next row. There are many types of markers you can buy or just use a piece of contrasting yarn. If you are only marking a spot to show you where you have started a row, you can loop a piece of yarn through that stitch. Tie it off in a big loop and just cut it away when you are done. No need for extra holders or stitch markers to do this. With the stitch markers on the market today I have collected quit a few different kinds. But I admit most of the time I use a piece of yarn to mark my place in knitting or crocheting. Not because I am cheap, just because it is handy.